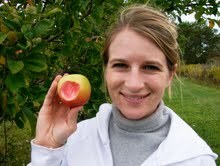 Today I'm interviewing Allison of Apolloson Acres who writes the blog, The Life of a Novice. You'll enjoy looking around the blog of this orchard farmer, but please take the opportunity to read about her horse's rescue. I teared up as I read the lovely story of a horse finding a forever home despite some challenges. How about that interview now? 1. Tell us about your farm. 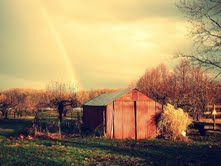 Our farm is almost 6 acres and has a 120 tree orchard on it. We were looking to purchase a house with property so I could bring my horses home with us. It just so happened this property had an apple orchard on it too! It's dreamy. I love it. 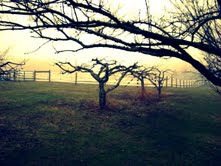 When the sun comes up over the orchard it is beautiful. And when the sun sets over the corn field across the street it's just as beautiful! I feel like this property holds so much potential for us and it allows us to be living out so many dreams! Our water on the farm is from a cistern, which means it is rain water that collects in a big 'vault' underground...or when there is a drought and the cistern runs low or empties, we have to have water hauled in. 2. What animals do you have? 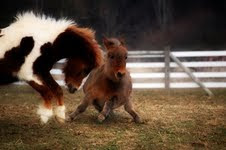 Currently we have 2 horses, a pony and a mini mule. 2 dogs, 1 indoor cat and technically, 1 barn cat....we refer to her, Savannah, as our Farm Manager and sometimes she let's other strays stop by for dinner! 3. How do the animals get their names? All of our horses came with their names when we adopted them. Apollo has a special story to his, which can be read on my blog, in his story. I named our dog, Wednesday because I LOVE halloween and her full name is actually Wednesday Winifred (witch names!). 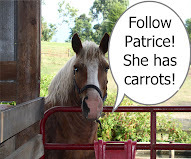 We call her Whinny (as in a horse whinny!) for short! My husband named our other dog, Mossy -- go figure, he is a hunter. And, when we rescued the mini mule, he inappropriately named her Daisy ;) Our cats came with their names too. 4. You have an orchard. Do either you or our husband have previous orchard experience? Absolutely none! Nada. None whatsoever!! 5. Were either you or your husband raised on a farm? Nope. My husband had an Aunt who had a hobby type farm when he was little. 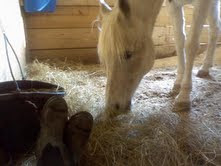 I day dreamed all the time about living on a farm and having horses. My mom said when I was little, I always used to want to be Amish. I say that this is only because Amish live on farms and have horses :) Lord knows I love my flushing toilet!! 7. 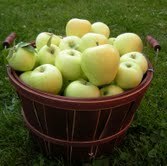 Since you grow apples, could you please tell us your favorite apple recipe? I am always up for a good apple crisp, but honestly, we have one tree that produces the most delicious apple I have ever tasted. I can't wait for that tree to harvest every year so I can pull an apple straight from it and eat it up. And I wish I could tell you the apple variety, but we have yet to figure it out. 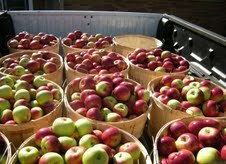 There is nothing better than fresh fruit right off the tree in the orchard! 8. 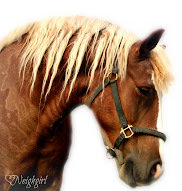 The story about your horse, Apollo, brought tears to my eyes. Which one of you has learned more since your "worst nightmare" has become a good dream? Ohhh good question. I would say we both learned what is most important in a relationship...trust and faith. We had to have faith in each other so we could learn to trust each other. Both of us placing trust in each other was so huge. It brings tears to my eyes just thinking about it. I have no doubt Apollo had more than a rough past. It took all he had to learn to place his trust in me. 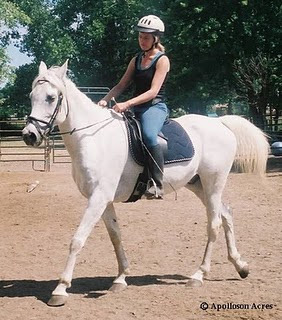 And there is no doubt my confidence was more than badly bruised after our accident(s) so it took a lot of trust on my end as well getting back into the saddle with him. But, overall, the bond this all allowed us to create is priceless. I will be lucky to ever experience it again. I only wish everyone could know what it feels like. The world would be a more peaceful place!! 10. Tell us how you got your farm name. Apolloson Acres is named after Apollo & me! My nickname for Apollo is 'apolloson'...it just kinda rolls off the tounge when I say it...and also just so happens to be his name with the second half of mine :) And I thought 'Apolloson Acres' had a nice ring to it. There is so much meaning there for me. Beyond the obvious with Apollo, I always dreamed I'd some day live on a farm and have horses. Now I do, so it was only fitting it be named after my first horse and me! Hubby always wants to know where his name fits in...since his name is 'Allen', I tell him the 'A' is for him! 12. What's in the future for your farm? Lots! We'd love to eventually get to the point where the farm could be hubby's full time job...but the thought of that big step makes me hyperventilate since we have bills to pay regardless of how mother nature feels, so..... We are going to add chickens next year for eggs. We tried for this year, but there is just too much going on with a newborn right now. In 2 years or so, we'd like to add goats and I am thinking possibly dairy goats. 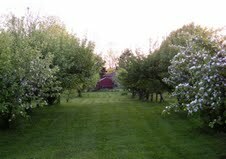 We'd like our orchard to become more profitable and we'll continue to add trees to it; possibly some plum trees or more pear trees as well. We'd like to get a decent veggie production going to where we might be able to offer some CSA shares and also set up a 'roadside shed' out at the end of our drive. And, my most magical dream is to offer equine educational programs for children and adults and possibly some equine therapy programs as well. Thank you for sharing your farm life with us, Allison. 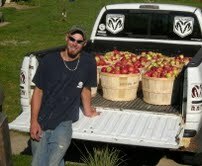 I wish you were closer and I could drop by and get my usual 6-8 bushels of apples. I wish you and your husband all the best with your orchard. Give Apollo an apple for me, please! Did I mention that I was having a little giveaway? I'm giving away my copy of the Dean Brothers Cookbook and a set of Paula Dean measuring spoons. Yes, sirs. You can serve me those yummy foods, but only if you'll join me! How cute is the top of these measuring spoons? Mandatory entry: Follow me and let me know your follower name. If you already follow me, just comment. If I don't hear from you a lot, then tell me your follower name. 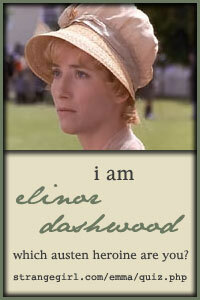 Vote for me on Picket Fences (see my sidebar) You can do this once a day until giveaway ends. 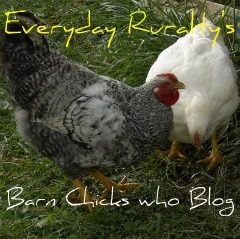 Join my BlogFrog Community. You can find this on my sidebar. Comment on one of the discussions in my BlogFrog Community. This blog is open to residents of the Continental US. I will chose one winner using Random.org. I will notify the winner and they will have 48 hours to respond or another winner will be chosen. This giveaway will end Tuesday, June 14th at midnight EST. Also tell him that Tuck and I are doing the dance of joy at his recovery! I am already a member of your blogfrog community! 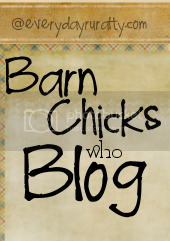 I love this blog! What a great interview. I will have to read the Apollo story, I am also a new follower. Loved getting to know Allison. going over to read about Apollo. Great interview. Can't wait to head over to her blog. Voted for you on fences. I follow you as CB. I enjoy stopping by pretty much everyday. Thanks for the good reads. Great interview. I'm a follower! Stopping by from the hop to say hello.